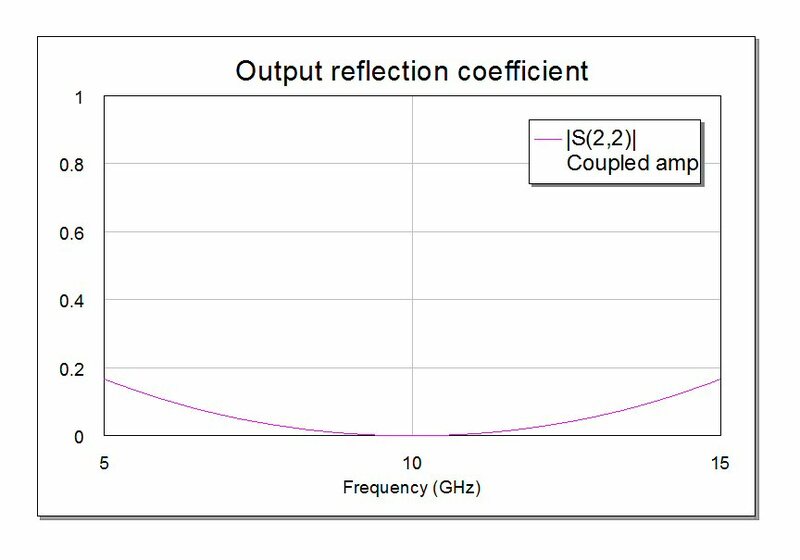 Learn about the effect of isolation load impedance match on the balanced amplifier output match. Our section on graceful degradation has been upgraded. Click here to learn about a special consideration for solid state power amplifiers. We've posted a wide variety of couplers and splitters. It's time we explored one of the main applications of splitters, which is combining amplifiers. This will take some time, and some class participation. As of December 2008, there are some new examples using the Lim Eom network which are linked from the bottom of this page. Combining can be done with reactive splitters, in phase matched splitters (Wilkinsons), 90 degree hybrids and 180 degree hybrids. It's important to understand the trade space of why you'd pick one over another. The two signals must be coherent, that is, they must be at the exact same frequency, and close in phase and amplitude. Being at the same frequency is not an issue when you are combining power amplifiers, because the signals started out from the same source before you split it. Stop here if you don't get that point, and consider your brother-in-law's offer of going 50% on a Quiznos franchise... at least you'll always have toasted snacks coming your way! All power amplifier technologies have limitations. Power combining allows you to overcome them. By far the most active area of power combining is in solid state power amplifiers, often abbreviated SSPAs. Over the years the holy grail of power combining is to replace a microwave tube with a solid state power amp. At first, tube engineers laughed at the puny efforts of solid state engineers, it takes a ridiculous amount of one watt amps to replace a hundred or even kilowatt amp. But over the years, as GaAs became pHEMT, and silicon carbide and GaN technology developed, suddenly they (we) don't look so stupid. Once you get to a magic number of eight devices needed to form the tube replacement, it becomes doable. How did we pick eight as the magic number? It's a pidooma. In a binary combiner, when the loss per combined section is -1 dB (not a very great splitter), the max power output would occur when eight amplifiers are combined. Sixteen amplifiers combined would have less power than eight in this case. Also, consider that the yield of an assembly with more than eight power amplifiers can be very low, and rework sometimes creates more problems than it solves. The bandwidth of many power combining schemes is very narrow, but in some cases that won't matter. For ultra-wideband applications, stay away from spatial combiners and coupled designs. A corporate structure using wideband Wilkinson power splitters can provide as much bandwidth as anyone really needs. Multi-section Wilkinson splitters are often used to power-combine broadband amplifiers. You need to be aware that when high power amps are out of phase, the Wilkinson's isolation resistors can dissipate a lot of power. This fact of life is often ignored in designs and even on data sheets... How many sections do you need to achieve your desired band? Here is a page that offers some advice. Maintaining low loss in a combiner is very important, especially in a corporate combiner. If you lose 1 dB in each stage, by the time you get to a three stage combiner you're throwing away half of your output power! Often overlooked are the routing losses associated with distributing the splits out to all those amplifiers... who cares if your Wilkinson has 0.2 dB loss if you lose 0.5 dB routing to the next split? For "N-way" efficiency, nothing beats a radial combiner. There is a famous paper about binary versus spatial combining by Robert York, we found an on-line copy here. This paper is referred to simply as "York's Paper" around the industry. The size of will be a function of the technique, as well as the media. For example, a radial combiner using stripline will be much smaller than a radial combiner using waveguide. Isolation is one of the most important qualities of a combiner network. Ideally you don't want any of the amplifiers to "see" each other. In practice it is often difficult to achieve 20 dB isolation between all branches of the network, but that might be enough. The most common problem of poor isolation in a combiner is that spurious oscillations can occur. For July 2017, this section was moved to a new page, find it here. Ideally, all of your power amplifier signals will add up coherently, and two plus two will equal four. Now wake up to reality: your power-combined amplifier will have transmission phase errors, and these will cause you to lose power. It's your job to minimize this problem! 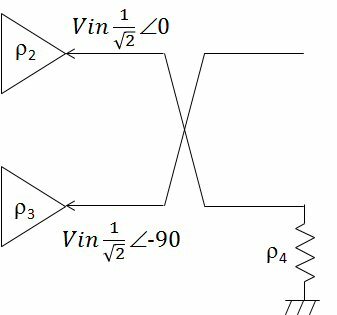 Phase errors can occur within the power splitter, the individual amplifiers, or the power combiner itself. At Microwaves101 we call this term the "phase efficiency" of a power-combined power amplifier, but you can call it anything you want. 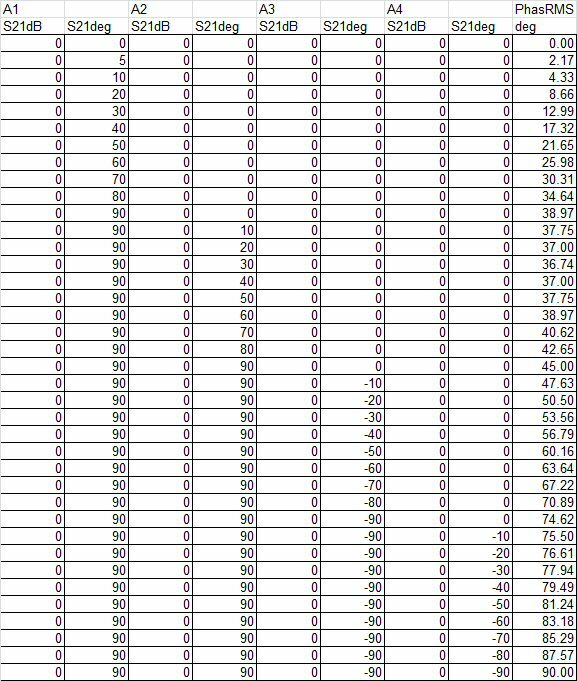 Below is a plot that we generated using Excel, to compute loss in power versus RMS phase errors, in this case for a four-way combiner. 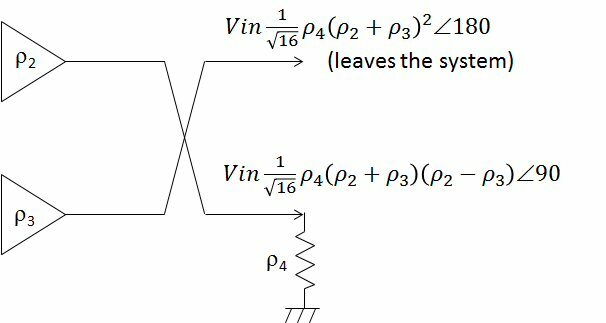 In computing degradation due to phase errors, be sure to convert power to voltage first. If anyone wants, we can supply the spreadsheet that did this calculation. Here are some data points that are "off the chart" for your contemplation: if RMS phase error is 45 degrees (like two amps out by 90 degrees) you lose 3 dB power, and half of your combined power goes to the isolation load. At this point, you added two amplifiers together and got the same result as a single amplifier. Pretty stupid on your part. Also, if the RMS error was 90 degrees (two amplifiers fighting each other at 180 degrees out of phase, which is the absolute worst you can achieve if you tried), all of the power goes to the load and it goes up in smoke. Update August 2012: that curve above was generated by painstaking means of generating four signal voltages in Excel, varying the phase and totaling up the wave. 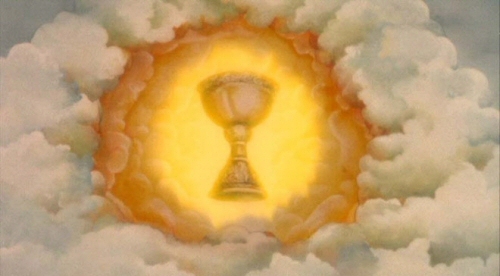 Doesn't it look familiar? 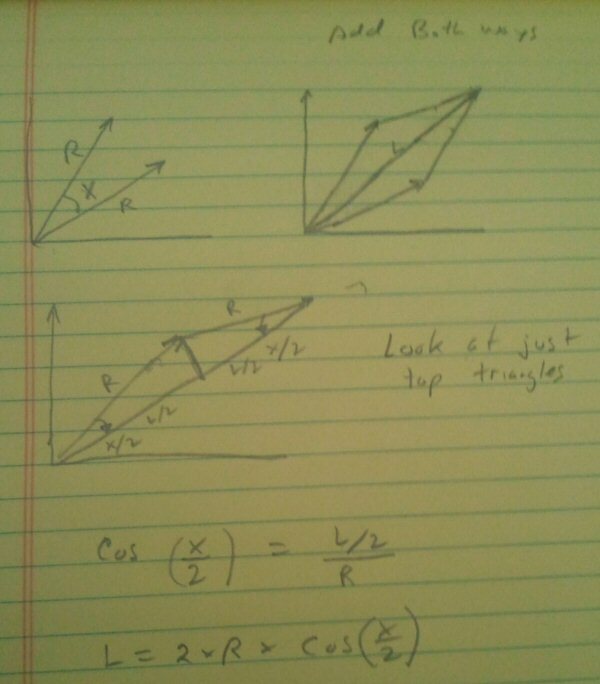 It should, because it is approximated by a cosine-squared function. Let's take a look at an example where we calculate the RMS error of four amplifiers as we shift the phases apart. 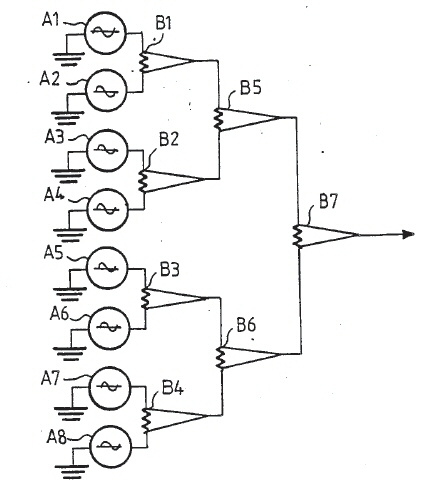 Below are the data on how we did this, A1, A2, A3 and A4 are the amplifiers, which all start out at 0 degrees phase. Then we gradually shifted first A1, then A2 toward 90 degrees, then A3 and A4 toward -90 degrees. 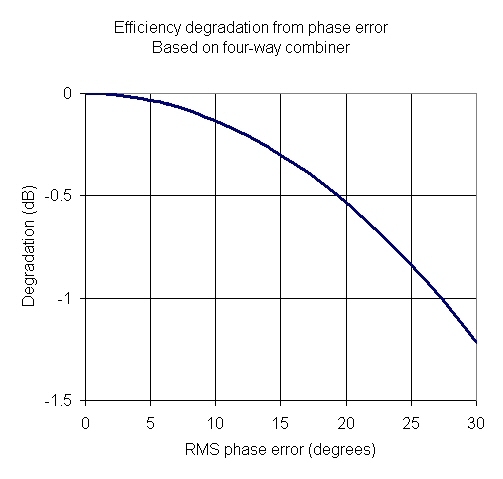 RMS phase error is calculated in the far right column. 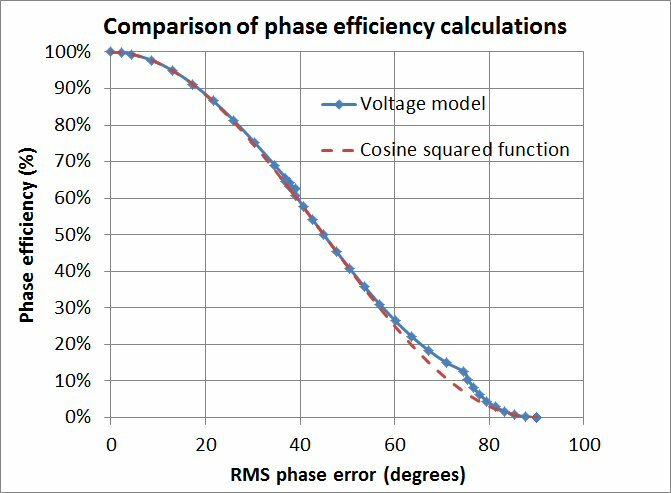 Now let's look at calculated phase efficiency versus RMS phase error, calculated both ways. It doesn't fit exactly, but it's really close. The voltage model curve will change depending on how the phase errors occur. If they were "more random", the two curves might lie on top of each other, don't you think? And who really cares if the fit starts to go south after 30 degrees RMS? Engineers need to focus on what is important, not what is unimportant, if you want to be a valuable to your company or customers. Now let's put out some Microwaves101 rule of thumb! #110: The phase efficiency is very nearly calculated as the cosine squared of the RMS phase error. If you want to have less than 0.5 dB combiner loss due to phase errors, make sure that your RMS phase error is less than 20 degrees (equivalent to two amplifiers out of phase by 40 degrees). In the case of a two-way combiner, the phase efficient is [cos(phi/2)]2 where phi is the phase angle between them (RMS value is 1/2 of the two-way phase spread). Here is the proof of how two equal amplitude signals combine to a voltage of 2Rcos(X/2). Power is the square of voltage. We'll clean it up someday when we are bored. Thanks for the help, Parrish! Variations in amplitude also cause a loss in power in an SSPA. But it is not as epic as phase errors. Typically you will have all of your amplifiers in gain compression and they are likely to be within 1 dB of each other. The loss in efficiency at this point is just a percent or two (much less than 0.1 dB). What style you pick has a big effect on second and third harmonics. This topic is covered in Practical RF System Design, by William F. Egan, this is a good book to buy if you want to move up the RF food chain. We'll summarize the outcomes according to Egan but skip the math. We also had some great help on this topic from Jack K. of Matrix Test Equipment! 90 degree combiners reduce the amplitudes of second order distortion products by 3 dB compared to the individual amplifiers because the level at each amplifier is 3 dB below a single stage amplifier and the slope of the second order distortion versus signal level is 2:1 so reducing the signal by 3 dB reduces the distortion by 6 dB and the signal to distortion changes by 3 dB. 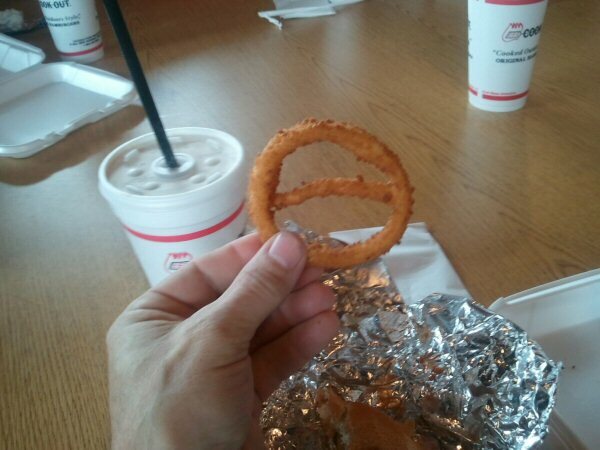 Third order distortions products which include 3A, 2A+B, A+B+C are canceled while 2A-B and A+B-C do not cancel. The level of the 2A-B and A+BC are lower by 6 dB because the level at each amplifier is 3 dB below a single stage amplifier and the slope of the third order distortion versus signal level is 3:1 so reducing the signal by 3 dB reduces the distortion by 9 dB and the signal to distortion changes by 6 dB. Unfortunately it is the 2A-B and the A+BC products that fall in band and cause problems. 180 degree combiners ideally eliminate even order harmonics and intermods. They have no effect on odd-order intermods and harmonics. Where do the "missing" signal products go? into the isolation load! Coupled, corporate, radial or spatial? A corporate combiner is shown below. This is a "third order" binary combiner, which combined eight sources (coherent amplifiers). This is a very straightforward combiner to develop, however, the loss can pile up, with each additional split the final combiner needs to span an ever-increasing distance. Also, the isolation between each amplifier is not equal. Below is a radial combiner. This type of design is also not for the faint of heart, however, it offers the most bandwidth. 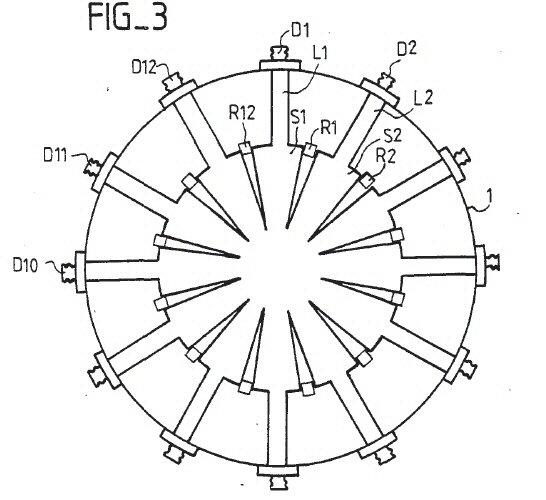 Wilkinson's original concept was a radial combiner. Radial combiners often suffer from poor isolation, and they can have tricky line impedance requirements: if you are combining ten fifty-ohm networks, the impedance at the junction is just five ohms. But they provide the least loss, and the highest bandwidth. Radial combiners made from waveguide are sometimes called "flower-petal mode transducers", and are a whole different ball game compared to "wired" radial combiners. Hey, who you callin' spacial? Unrelated to CAP's solution, this image came from US patent 5,214,394, High-efficiency, bi-directional spatial power combiner amplifier. 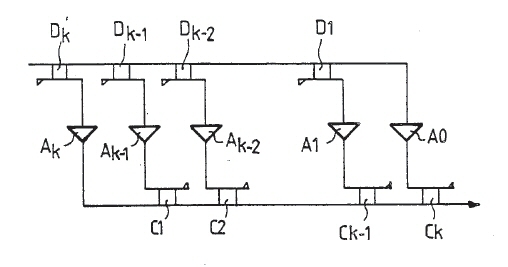 In this combiner, a two-dimensional array of amplifiers is illuminated from a feed horn. Each amplifier has two antennas at opposite polarization, vertical for input and horizontal for output for example. An ortho-mode transducer or circulator can be used to separate the input and output signals. 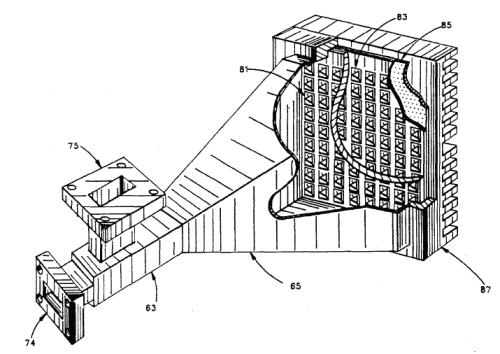 By locating the input and output an the same side of the array, the inventors have solve the problem of heat sinking. 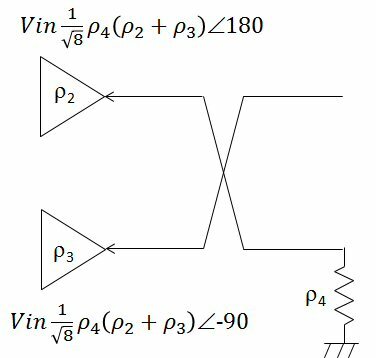 For the spatial combiner, it is difficult to achieve uniform power split to each amplifier, and there is "spillover loss" associated with the illumination going outside the array. Gain is low, in the case of the reflecting array above, you can't exceed the isolation of the two polarizations; you might need a second, smaller array to drive the first one. The bandwidth will be narrow, and it is hard to imagine that you could make such a combiner cheaply. Other than that, Mrs. Lincoln, how was the play? Reactive, quadrature, 180 degree or in-phase? The term "reactive" in this case means that no resistors are used to terminate the errors of an out-of-phase condition (like they would in a Wilkinson structure). Reactive combiners can sometimes suffer from oscillations which are the result of the "odd mode" where adjacent amplifiers become 180 degrees out of phase. Also, if one amplifier fails, you are in a world of hurt as it will surely pull down the other amplifiers. This is by far the most popular amp combining method, when you only have two amplifiers to combine. Examples include the Lange, branchline, and overlay couplers. The input and output return losses of amplifiers are vastly improved when 90 degree combiner is used. The reflected power from the amps is dissipated in the load on the "isolated" port. For an explanation of this, go to our page on quadrature couplers. Using quadrature combiners can provide an appreciable degree of immunity to load-pull effects, for example, when a solid-state power amplifier is connected to an antenna that has less than perfect impedance match. Learn about this phenomenon here! One great reason for quadrature combining is that you know longer have to worry about load-pulling your driver amplifier. Some MMIC power amps have S11 as bad as -3 dB. If your driver amp see such a mismatch, all bets on driving the SSPA to saturation are out the window. 180 degree splitters include the rat-race, and the waveguide magic tee. A balun can also serve as a 180 degree combiner, often over very wide bandwidth. The VSWR of the amplifiers is NOT reduced in a 180 combiner. These provide isolation between the amplifiers, the classic example is the Wilkinson. The Wilkinson splitter also has a fairly wideband response and by adding more sections the bandwidth can be increased. The Gysel is also a popular in-phase combiner. It offers a distinct advantage over the Wilkinson, in that the isolation loads are one-ports and can be pulled away from the splitter, such that much more power can be dissipated. If you broke into the transmitter floors inside the Empire State Building you might find an entire "herd" of Gysels combining redundant tubes that power up a score of commercial broadcasting systems! By the way, you'd think that having a megawatt of RF power from one site might cause a little concern about health issues, compared to all the hype about handsets. 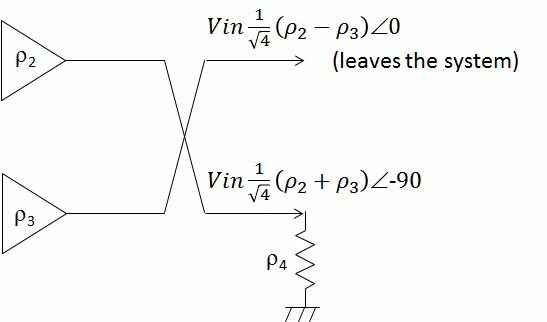 What is the effect of a mismatched isolation load on the output impedance of an SSPA? The answer is "it depends". 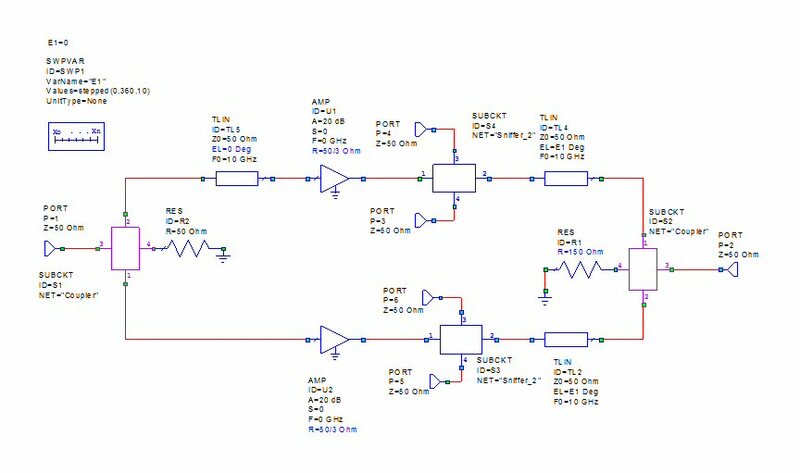 For now, let's consider the effect in a two-way combiner that uses ideal quadrature couplers. Let's also assume that the output port sees a perfect match, while we allow the other ports to have reflection coefficients as numbered below, which can be assumed to be vector quantities. 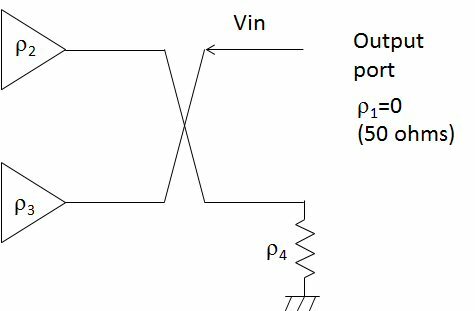 This figure represents the initial condition when a signal of "Vin" is present at the output port. At the first split, each amplifier sees 1/SQRT(2) of the input signal. The phases through a coupled line are as follows: the through path gets -90 degree phase shift, while the coupled path gets 0 degrees. Got that? Now let's look at the returning voltages after the first bounce. 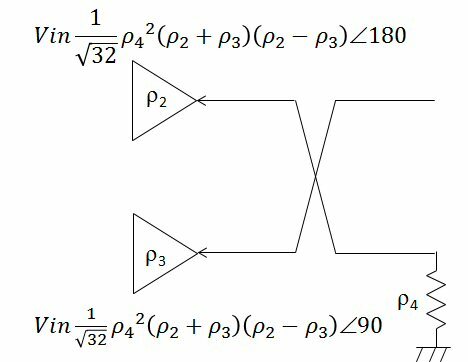 The signal that returns to the output port is 1/2 of the input signal multi pled by the difference in reflection coefficient as the amplifiers. This is part of the magic of a balanced amplifier. No matter how crappy the amplifiers are impedance matched, they cancel out (at least on the first bounce). The signal at the output port leaves the system, as we are assuming that it the one port that is actually matched to fifty ohms. If the amplifiers are imperfectly matched, there can be substantial signal at the isolation load, for example, of rho2 and rho3 are 0.5, fully 1/2 of the input voltage arrives here. By "substantial" we mean relative to the signal that entered. This is likely a small signal, so we are not talking about any real power. There are other considerations for sizing that load for power which we will address somewhere else. Now what happens after the second bounce? This is the case if the isolation load is mismatched. The reflected signal lands on the amplifiers, reduced by the isolation load's reflection coefficient rho4. On the third bounce, another signal exits the amplifier, but it is greatly reduced compared to the input signal. This reflected signal is present even if the two amplifiers have the exact same reflection coefficient. One the fourth bounce, some more of the signal reflects off of the isolation load, but it is much smaller, and if those amplifiers were identical, this signal would be zero. At the fifth bounce some more signal exits, and some more is returned to the isolation load. This is making us dizzy! You can see how an infinite series can be constructed, but the terms keep getting smaller and smaller. You can see that unless the two amplifiers present short circuits, the reflection coefficient due to the termination is reduced in effect. For example, if each power amplifier had a 3:1 VSWR at equal phase, the amp reflection coefficients are 0.5. If the load was also a 3:1 mismatch, the net reflection coefficient is 0.125 (it is reduced by a factor of four. Sweet! Next: is it possible that a poorly-matched isolation load could load-pull your power amplifier? The short answer: normally, no, but if something comes out of balance, yes. Oops, we forgot to mention, the above analysis was only at center frequency. Let's use some expensive EDA software from a nameless company that should sponsor Microwaves101. Here is an ideal balanced amp. We installed the "Sniffer" at the outputs of each amp so that we can look at what reflection coefficients they see. We added some phase lengths to each output that we will sweep such that any possible phase angle is presented when we mismatch the amps. We also put in another transmission line on the input of the upper amp which we can use to drive the amps out of phase. For now it is set to zero. 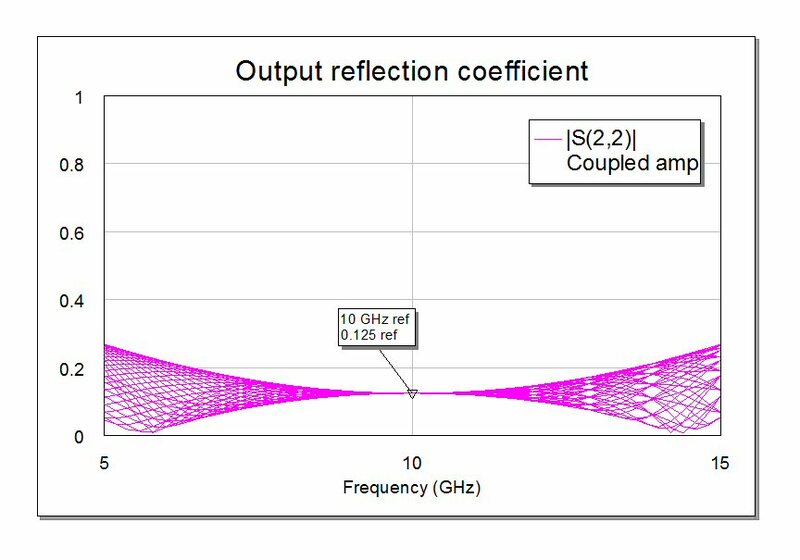 Below is the output reflection coefficient which is zero at center frequency but increases at the band edges. Nothing in this world is perfect, you have to live with it. Lo and behold, the math that we did upstairs is valid, the net output reflection coefficient is 0.125 for any reflection phase angle at the amps. But only at center frequency.